Well we kicked off our new Kitchen Trends blog series in 2016 with a look forward to trends for the coming year. 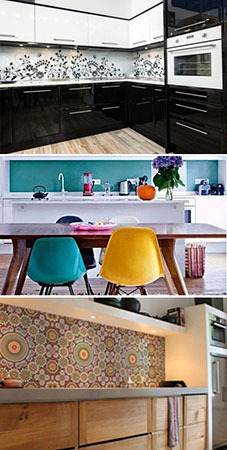 Within that we predicted thin counter tops, statement colour accents, horizontal cabinets, texture and metal finishes. Many of which we have seen (especially colour accents and thin counter tops) and some that are still gaining in popularity as we head towards a new year. We’re now going to do the same for 2017 and look into our crystal-kitchen-ball to see what new ideas we’re likely to see this year. Michael Jackson once told us that it doesn’t matter if you’re black or white but when it comes to kitchens it would appear that both together is a winning combination! Black and white kitchens (also known as ‘tuxedo kitchens’ in trendy kitchen design magazines) are tipped to be the next big colour combination (or should that be ‘colour-less’ combination?). These monochrome designs are kept very simple without the introduction of any other colour to soften the look. The result is a high impact, modern kitchen with clean lines and is a long way from the ‘hippy’ vintage kitchens that have been very popular for the last few years. It’s certainly a very bold look that will only suit certain types of house but if it’s a little too stark for you, you could consider a patterned floor or splashback tile to break up the great areas of black and white a little. For those who need colour in their life, keep it light and bright in 2017. Muted vintage colours – dove greys, duck egg blues and dusty roses - are moving aside for brighter tones but only as accents, teamed with bright whites. 2 materials that we expect to see much more of in 2017 are wood and cork. Not so much in terms of kitchen cupboard materials but used as accents in kitchen spaces. This may be a wall of wood panelling or a cork board wall or cladding end sections or island units in wood. This can work for a very modern kitchen in a smooth walnut or exotic Zebrano or a vintage style one with reclaimed planks. Building your appliances into your kitchen cupboards is nothing new but while the vintage style kitchens popular over the last few years have not been shy about exposing their appliances for all to see, the new modern kitchens are once again hiding them away. This creates a tidier, uninterrupted style. See our previous blog about whether to integrate or not. Patterned tiles, blinds, flooring and wall coverings have been around for quite a while and showing no sign of going anywhere just yet. Pattern is a great way of injecting personality into an otherwise neutral kitchen and allows you to change the style of the kitchen space as often as you like. We’ve featured a few images curated from our own kitchens and from around the internet for illustration purposes here, however you can find many more examples on our Pinterest board, created to accompany this blog post. See our Kitchen Trend Predictions 2017 board here. Will we see these 5 kitchen trends become popular in 2017? We’ll be following national trends closely as well as listening to our own customers as always. Some trends take traction quickly while others simmer and take a while to catch on. Keep checking back to the blog for updates and of course, keep reading our regular kitchen trends blog – published on the 1st of every month. Choosing a kitchen is not like picking an outfit and shouldn’t be too influenced by fashion and trends. These ideas are featured to inspire you and start the creative process but of course your kitchen will be individual to you. The process starts with a design consultation which is free of charge. Let us show you what you could create in your kitchen and start your New Year off with a new exciting project! Call us on 0800 321 3491 or request an appointment here. 0 Responses to "Kitchen Trends blog – January 2017"